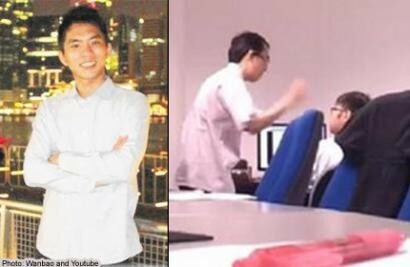 Singapore- The intern who captured footage of a fellow intern being hit and scolded by a software firm owner has been lauded by the public for exposing the abuse. He has been getting praise from the online community for recording the abuse and stepping forward to expose it. But 23-year-old Yang Jie Xiang told Chinese evening daily Lianhe Wanbao that he believed another person in a similar situation would have acted in the same way as him. Yang put up the 17-second video on Youtube, which showed the owner of software company Encore eServices, slapping a 29-year-old university graduate. The video has since garnered the attention of NTUC deputy Secretary-General Heng Chee How, who condemned the abuse of workers in a Facebook post. It has also attracted the Ministry of Manpower's attention, as the agency stepped forward to investigate the abuse claims. The 29-year-old intern and his family has also since lodged a police report. The victim's parents earlier confronted their son's supervisor, who then apologised for slapping the man. They refused to accept his apology. Meanwhile, netizens has been heaping praises on him not just for his sense of justice but for his good looks. The whistleblower is also garnering attention for his good looks. One netizen, Lily Sng, was quoted in the Chinese daily: "Your parents must be proud of you for doing what you have to do and setting yourself as an example of being a good-looking hero." Another netizen, Chang Murng Sing, praised Yang for being willing to step up, but commented that there were not enough of such courageous youths.